I have a handfull of older Wraiths and Banshees that will remain with the Legion, but all of the new Nighthaunt units and the Hexwraiths and Spirit Hosts from my backlog will be earmarked for the Nighthaunt army. I'll also be swapping over my Choir of Death Tomb Banshees and Korak the Grim. The theme of this new army, and its backstory will be set in the Age of Sigmar, whereas my Legion army is still set during the time of the Old World. My Legion of the Infernal Skull is a collection that I've been amassing for over 20 years, and it's staying on square bases, but the Nighthaunt army will get rounds. When I built the Choir banshees, I planned for this, and magnetized them to swap between rounds and squares. I'll still be using them in my Legion army, so whichever army they are fielded with their bases will match. The only other finished Nighthaunt unit I have is six Spirit Hosts, which I will need to re-base on rounds. I want to salvage the work I put into their bases, but I can't just trim away the edge and stick the flat top onto a round because of the pegs underneath the 40mm squares. I think I have a solution, though. If it works I'll make sure to post a tutorial. 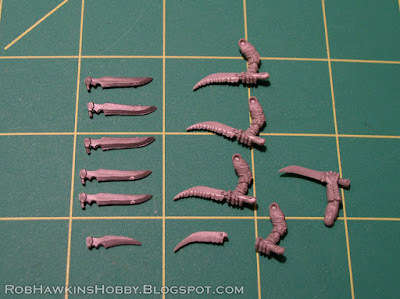 In order to swap out the maces, swords, and axes for hand sickles, I dug through my parts box for any weapons that might pass for scythe blades. 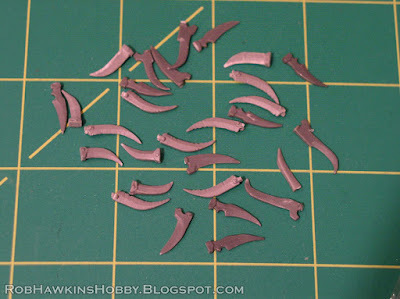 I carved them down with a hobby knife to make a bunch of little scythes. I clipped off all the axe and mace heads and, using a .55mm bit and a pin vise, I drilled down out the length of the remaining weapon handles. (Yes, really.) I inserted a length of thin wire into the handle, and then bent the handles a little to give them the distinctive curve of a sickle's handle, the wire allowing the plastic to retain the new shape. I bent the bit of wire sticking out the top 90-degrees, and used it to pin the blade to the handle. Finally, a little bit of putty was used to cover the exposed wire and form the top of the handle. The models with swords were a little simpler. I removed the blade and cross guard, leaving just the hilt. On top of the hand, I glued a little disc, cut from styrene plastic rod, to be the top of the handle. Then, I used a .85mm bit to drill through the disc, into the hand, and inserted a piece of bent wire (a paper clip), to complete the sickle handle. The blades themselves were cut from thick styrene card, and carved into shape. These blades were pinned onto the handle wire. The models were then based with a mix of fine and coarse ballast, super-glued on so it will hold up when painting. Extra details like skulls and small tombstones were also added. For the Dreadwardens, I wanted to do something different. I'm not sold on the whole "candle" motif, and I'm trying to avoid flames in this army to distinguish it from the Legion of the Infernal Skull. So, I cut away the candle and weapon and removed the arms, intending to replace them with the spare bell arms from a Grimghast Reaper. Unfortunately, the angle and length of the arms wouldn't fit the way I wanted them to, so I had to settle for using just the tiny hands and wire armatures for the arms. It was a major pain to get the positioning down, but I finally got the model to hold a large scythe, which I built from the plastic Zombie scythe and a metal Cairn Wraith scythe blade, pinned together with a wire. The gaps in the handle were covered with putty and shaved down to match the thickness of the handle wood. I still need to sculpt the arms of the Dreadwardens. Another last-minute change I made was to replace the helmeted head. I wanted to give the wardens "regular" skull faces, so I took some spare Black Knight heads and shaved down the helmets. The remaining helmet mass will be sculpted over to create hoods similar to the rest of the unit. I haven't touched these models in about a year. This photo is from last January, and the only progress I've made was to put a wash on those white Spirit Hosts. These are my first priority after the Chainrasp Horde. 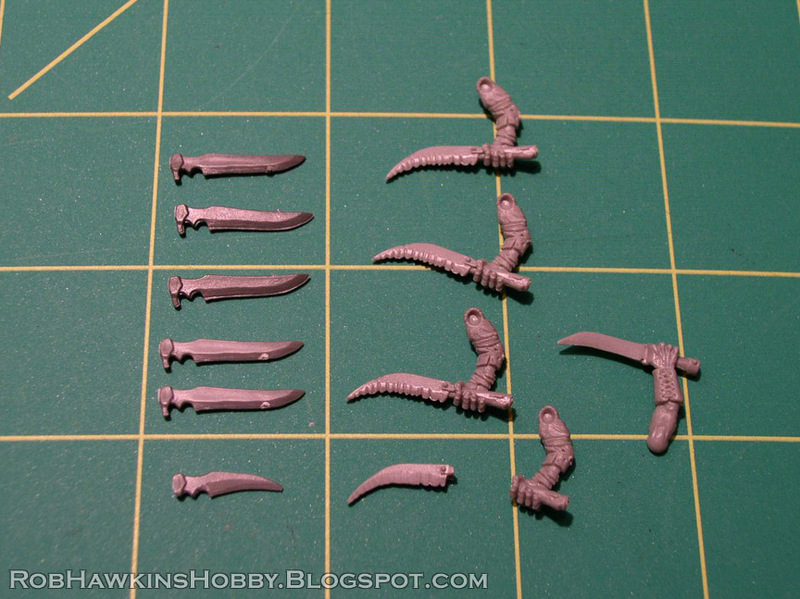 I'm going to use a black primer for the "wraith" units like the Chainrasps which don't have a lot of white ethereal wisps. 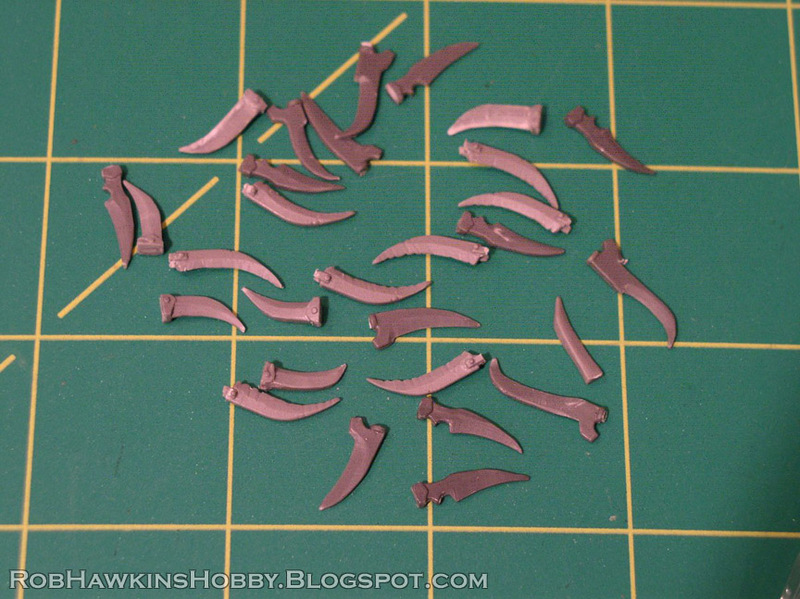 The plan is to paint them from a black undercoat, and then blend up to the lighter tips at the base of their cloaks. After the Chainrasps, I'll finish these Hexwraiths, and then the Spirit Hosts. I'll use the smaller projects like re-basing Korak and the Spirit Hosts when I need a break from batch-painting. These units form the regimental core of the army. and clock in around 1500 points. I also have Kurdoss the Craven King in the army shot at the top, who would push it up past 1700 points. He's the only one of the unique characters that I'm really interested in fielding; I generally don't use special characters, preferring to build on the narrative of my own characters. I have Reikenor, who I'll be converting into a Dreadblade Harrow version of Korak. Can't wait to see this project develop! Need to emulate your process of planning and executing a hobby plan.I appreciate your commitment to making the models fit your vision for the force. I am sure that the result will be magnificent. Your tenacity impels me to do my own projects, thank you. I love how all your projects are planned like that, my purchases and builds are usually just a spur of the moment. You're also going through a lot of trouble to make sure they can be on both square and round bases, I can't help but admire your commitment here to keep everything visually together as a Force. I usually don't collect and build with any specific list in mind, I just get a bunch of everything. When the army launched, pre-ordered a bunch of stuff and it's been sitting around, waiting for me to get to it. In general, I never purchase anything that I don't plan to paint and play with *someday. * That limits me to models for my armies and that's about it.